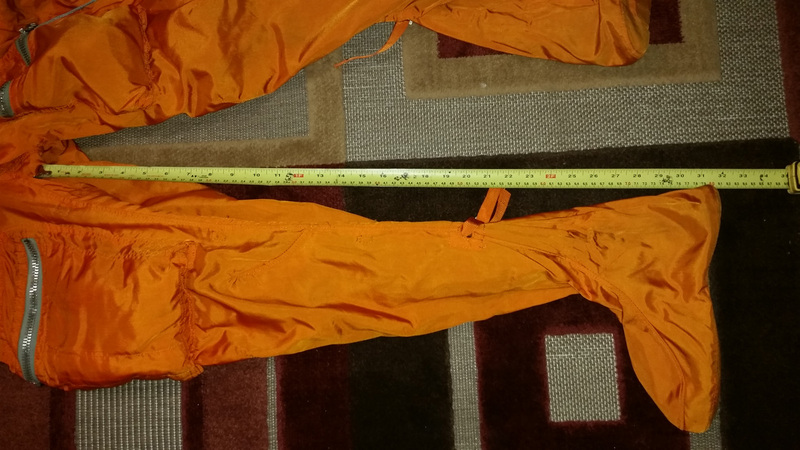 Bright orange pilot suit of the VMSK-4 outfit. 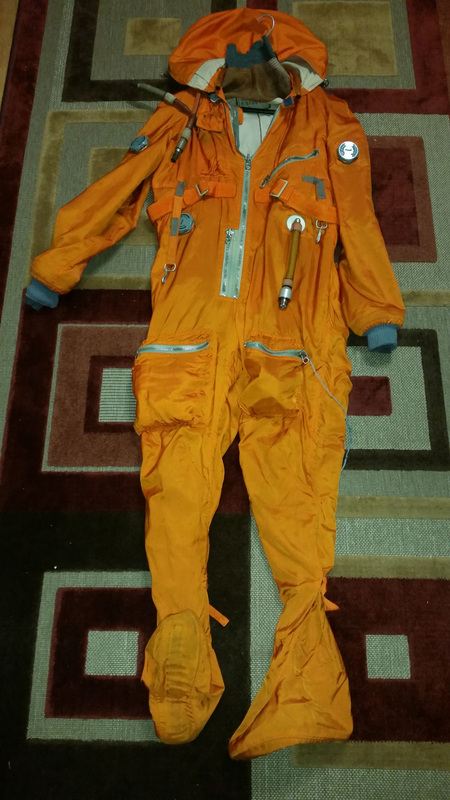 This suit is worn by pilots over all the other suits that complete the VMSK outfit. It consists out of a number of components – VMSK-4, MK-4 and VZK-4. 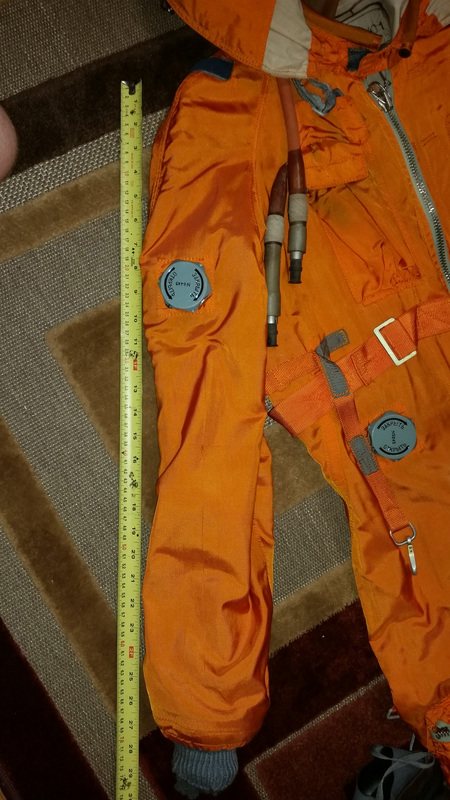 MK-4 ( “Morskoi Kostyum-4” – “Sea Suit-4” ) and VZK-4 ( “Vodozashitnii Kostum-4” – “Water Resistant Suit-4” ) are internal parts of the bright orange VMSK-4 suit. 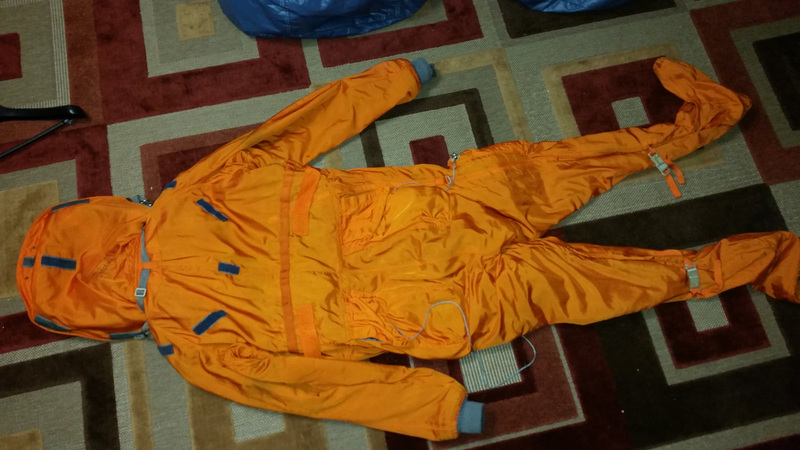 Internal suits are made out of the rubberized material to keep the water away from reaching pilot’s body. 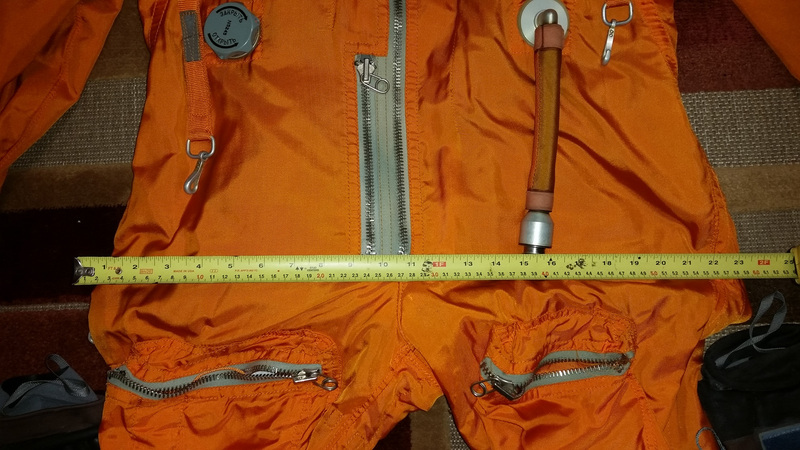 To dress up into this combo, pilot first unzips the VMSK-4 main zipper and gets into internal suits by the means of the big opening located in the waits area of these suits. 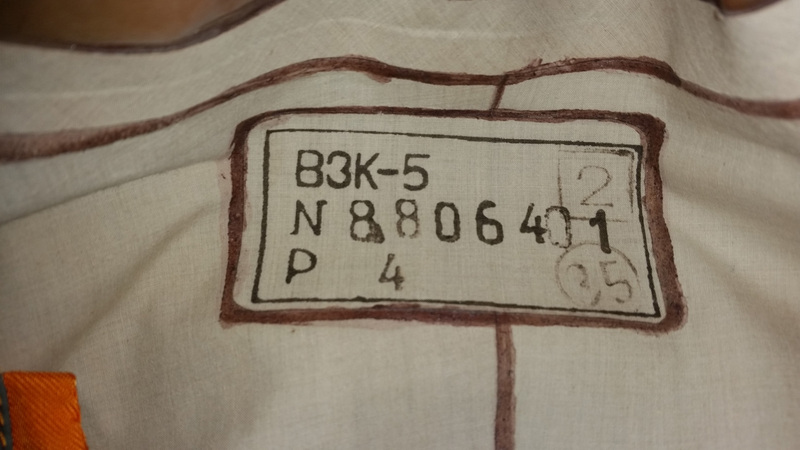 Once inside, pilot ties a a special rubber band around extra material and zips up the VMSK-4 suit. 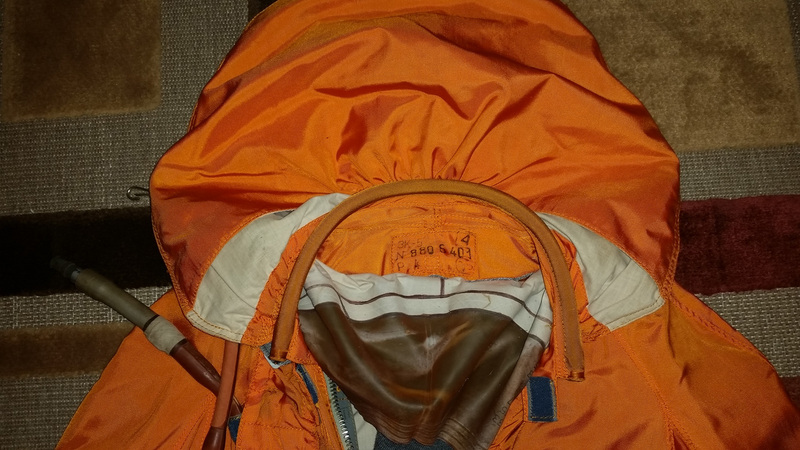 To keep the cold water away from pilot’s hands, back pockets of the VMSK-4 suit contain three-fingered GP-2M-1 gloves ( “GP” stands for the “hermetic gloves”). These gloves are made out of a warm material with small rubber inserts on top to “seal” them on pilot’s hands. Also located on the outside top part of the gloves is a rolled up “sleeve” which pilot unrolls when putting them on. 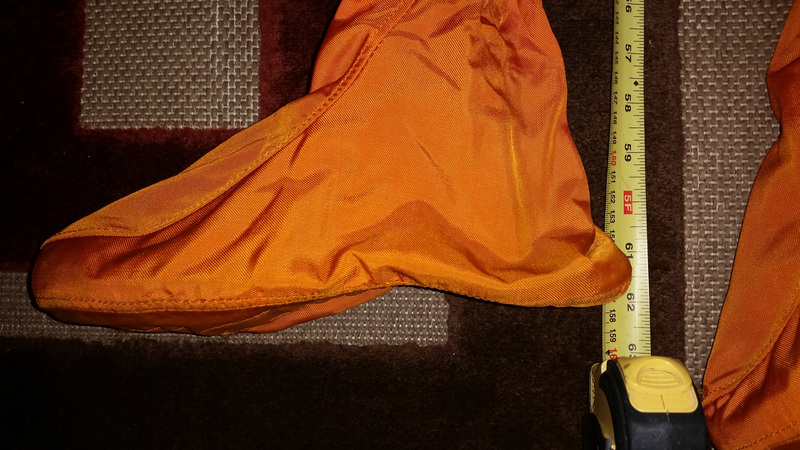 Gloves are not meant to be warn all the time, only in case of emergency and to make sure gloves stay together with the suit no matter what (for example in a sea with big waves), they are tied to VMSK-4 with long threads. 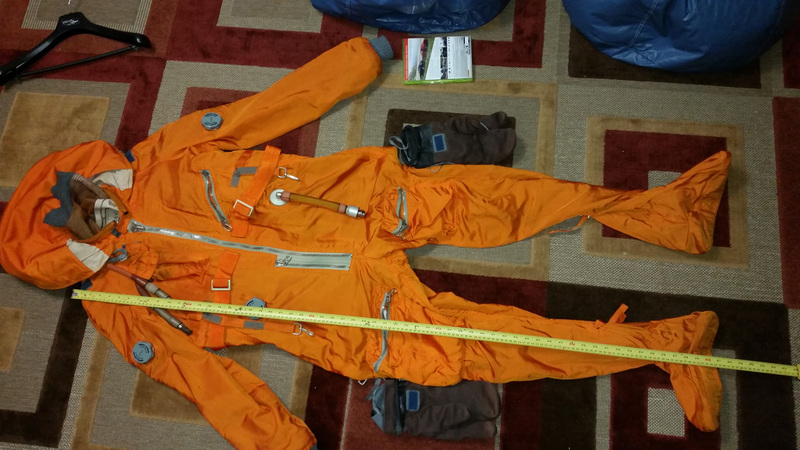 Overview of the VMSK-4 suit – on the left is the front side of the suit. 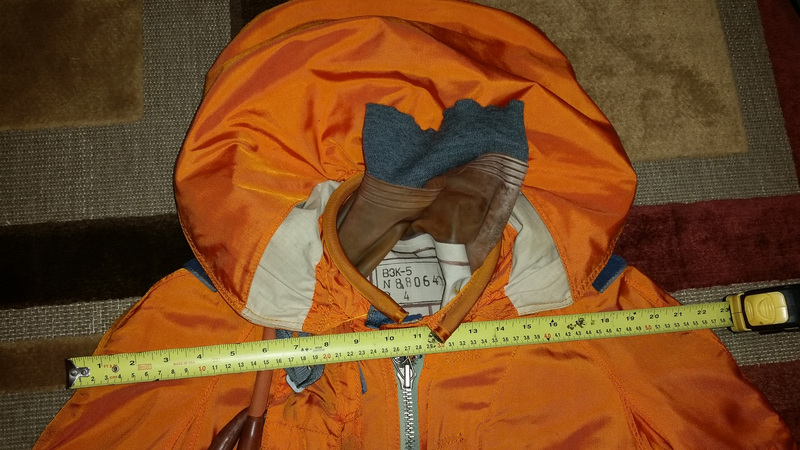 Note numerous pockets on the front side and two pockets on the back with GP-2M-1 gloves inside. 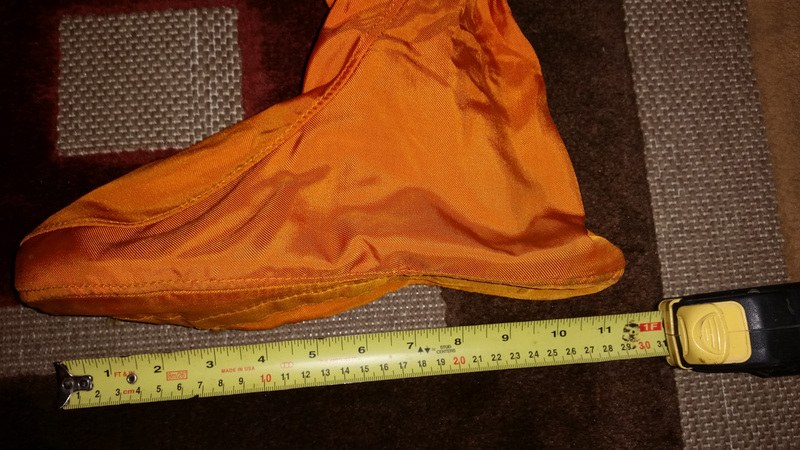 Also of interest are the small orange bands that come from the suit near the foot area. These are used to tie the suit to the VMSK boots. 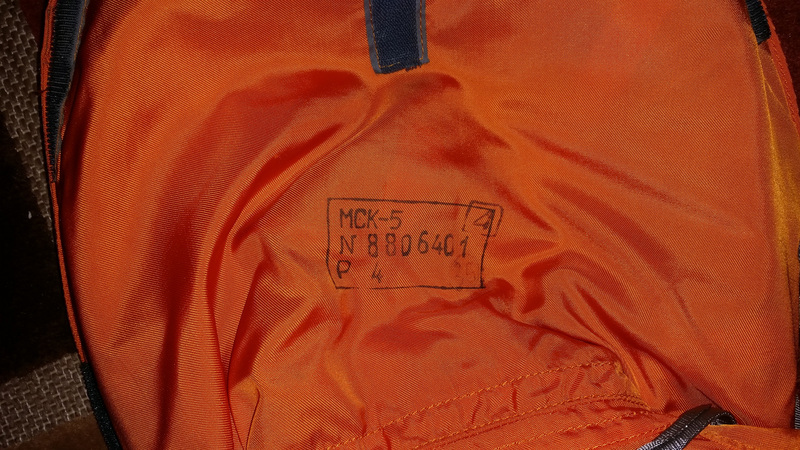 Located inside of the suit, in the right shoulder area, is the VMSK-4 ID tag. 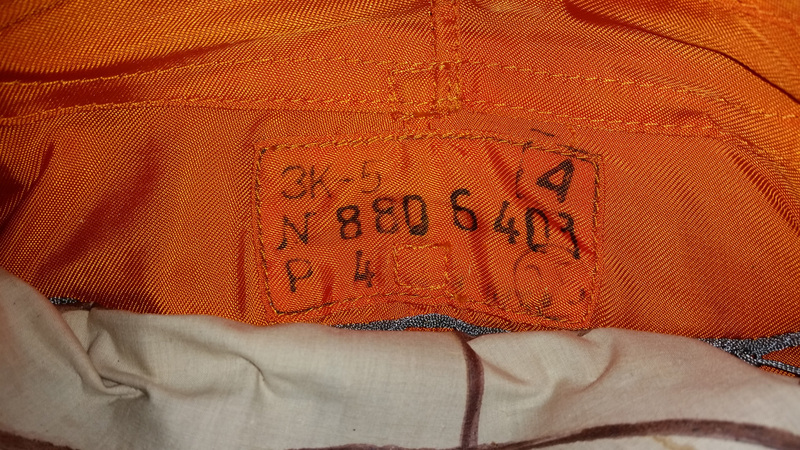 ID stamps of the MK-4 and VZK-4 suits located on the rubberized material inside of the VMSK-4. 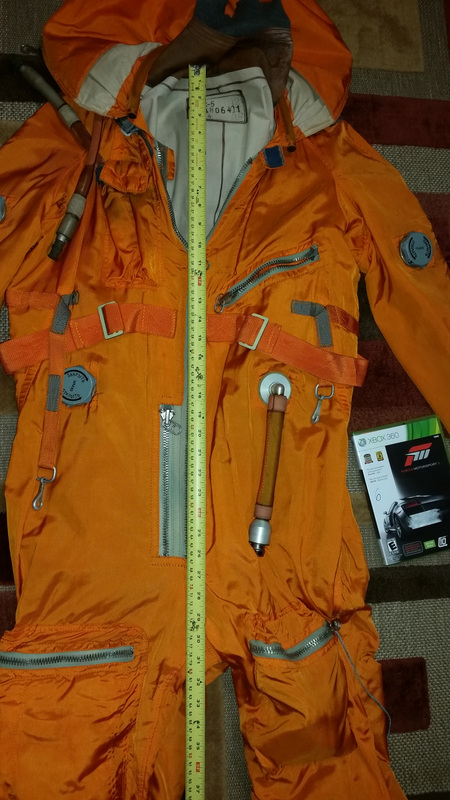 VKK-15K High-Altitude Pressure Suit Basic specifications Max pressure, kgf/cm2: bladder 0.9 capstan 0.5 Max cockpit depressurization altitude, km 20 Operational time at an altitude of over 12 km (rapid cockpit depressurisation), min 3 including time at altitude of 20 km, min 1 Weight, kg not more than 4.65 Service life, yrs 5 The VKK-15K high-altitude pressure suit is a fighter pilot’s flight gear designed to provide life support and enhance performance of flight personnel. It is used in flight missions over land. 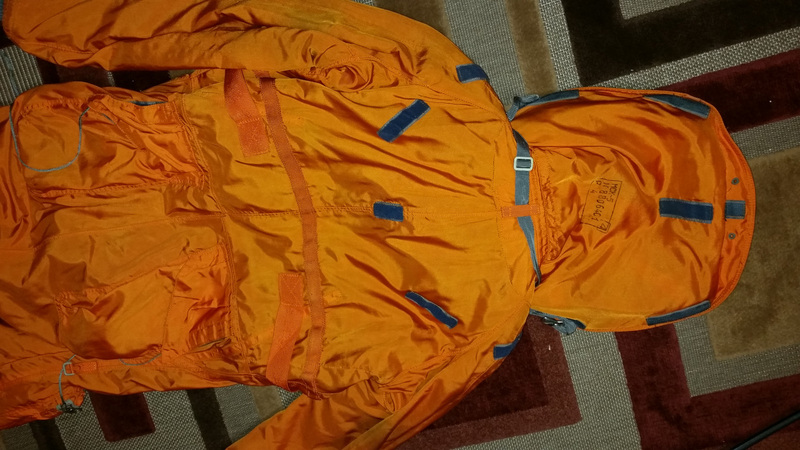 VMSK-4-15 Sea Survival High-Altitude Suit Basic specifications Max suit ventilation system resistance, kPa (mm H2O) for air consumption of 250±10 litres/min 4.5 (500) Max differential air pressure inside the water-tight suit, kPa (mm H2O) for air consumption of 350±10 litres/min 0.49 (50) Max margin air leak at a pressure inside the MK-4-15 suit of (2.94±10) kPa (300±10 mm H2O), litres/min 1.5 Max weight, kg not more than 17 Service life, yrs 5 The VMSK-4-15 suit is designed to provide individual life support to aircraft crews operating over ground and sea at high and low altitudes. 147 PPK-3-120 Anti-G Suit The PPK-3-120 anti-G suit is designed to increase limits of head-to-seat accelerations sustained by fighter pilots. 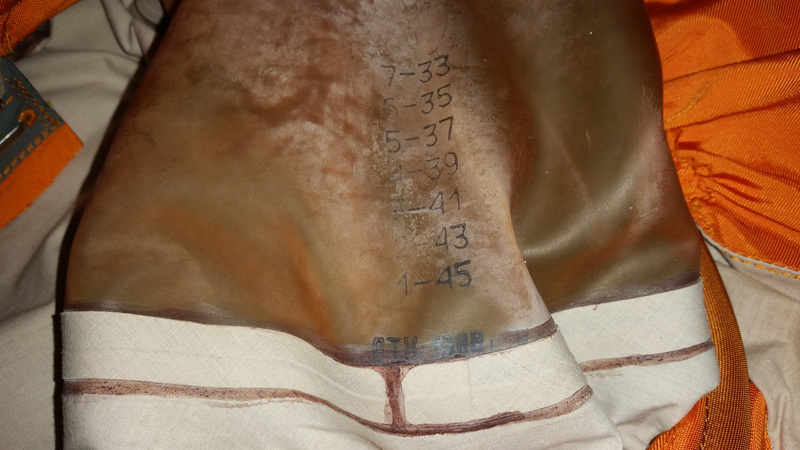 Safe working pressure in suit chamber, kPa (kgf/sq.cm) 88.2 (0.9) Permissible pressure drop in suit system within 1 min when checking air tightness at initial pressure of 88.2 kPa (0.9 kgf/sq.cm), max 8.82 (0.09) Weight, kg 4.5 Service life, yrs 8 VK-3M Air Ventilation Suit The VK-3M air ventilation suit is designed to protect pilot from ambient temperature effects. 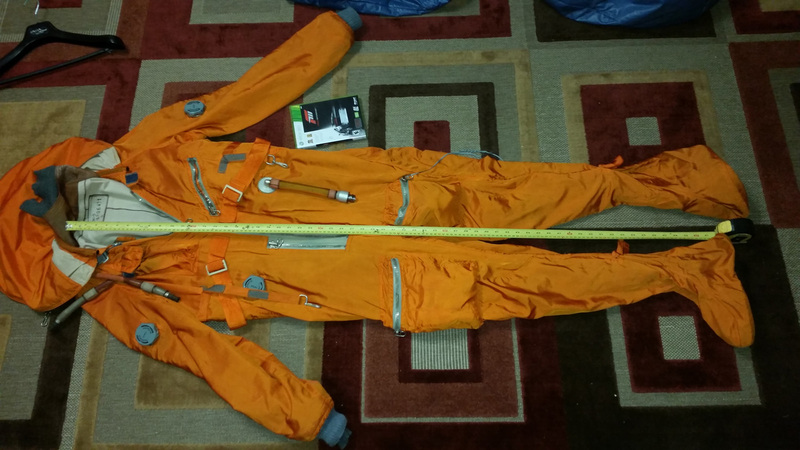 It can be used independently or together with the high-altitude pressure suit. The suit neither restrains pilot’s movements nor discomforts him physically. The air ventilation system provides even air distribution all over the body surface and prevents it from excessive heating or cooling down both at airfield and in 1-1.5h flight with ambient air temperatures of ± 50oC. 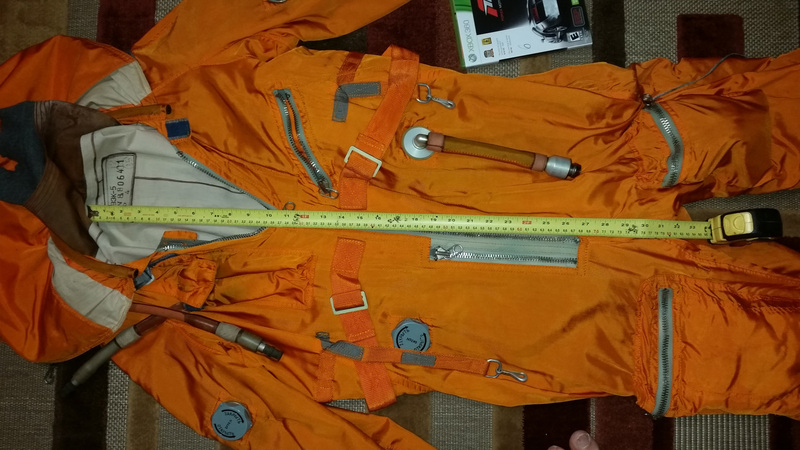 The suit weight is under 1.85 kg. 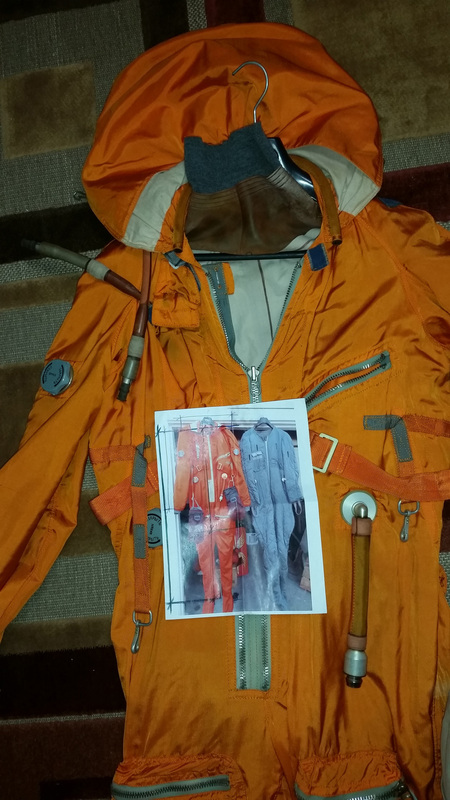 This VMSK-4-12 unit with four tags comprises the orange outer suit for flights over water for visibility in case of a crash with ZK-4 inner sweater, MK-4 component and inner VZK-4 dry suit liner and is accompanied by orange neck drape. 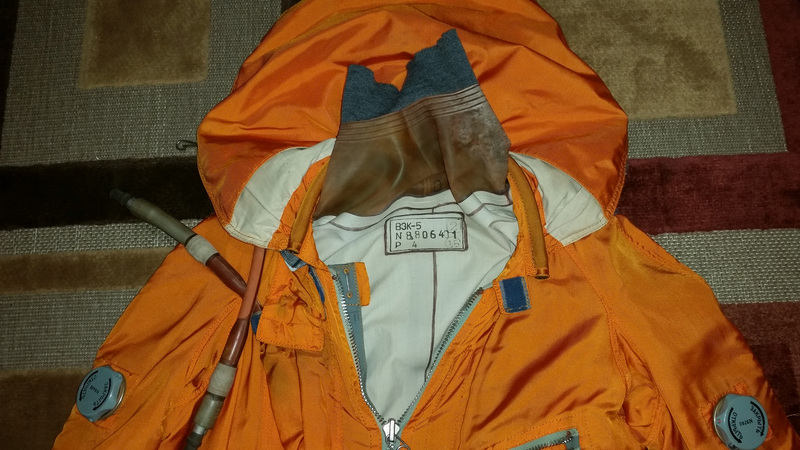 This is worn over TZK-2M thermal suit for warmth and olive green VKK-6ML partial pressure suit with orange connection hose accompanied by VKK-6M storage bag plus life preserver units on either side of white belt. Dry suit three finger pilot gloves also present. 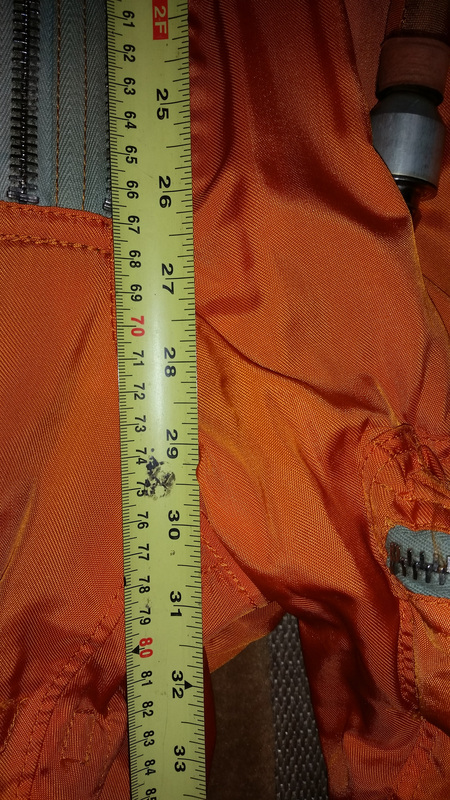 A large zippered olive green flight suit bag is included plus an unidentified component. All have correct Russian stamped markings.